As a Certified Copyright Manager, Ingrassia coaches academic and business organizations through the “grey, murky ooze” that is copyright in the Digital Age. She views copyright literacy and management as an essential risk management skill for any professional organization. So, identify what you are most passionate about. What excites you so much that you can’t wait to jump out of bed in the morning to start your day? Take time every day–even if it is only 15 minutes–to reflect on what it is you REALLY want to accomplish in this life. And then, learn from the turtle. The turtle only makes progress when it sticks its neck out. Don’t let anyone ever say that you didn’t try. If something speaks to your heart, don’t hold back…JUMP! Do it NOW…so that you do not regret it later. 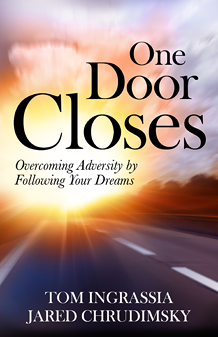 Our new book, One Door Closes: Overcoming Adversity By Following Your Dreams (Wyatt-Mackenzie Publishing) is now available from Amazon. Visit the One Door Opens tab on the homepage to be taken to the order page. One Door Closes captures the inspirational, highly emotional stories of 16 individuals from all walks of life who have triumphed over seemingly insurmountable obstacles to achieve their goals. Through first-person accounts, these courageous survivors describe their personal approaches to living their lives with vision, courage, determination and passion. They share the wisdom they learned along the way–often the hard way–wisdom readers can use on their own journeys. Many are sharing their stories publicly for the first time. Also included are 10 systematic self-assessment tools designed to guide readers to develop their own, personal blueprint for success. Among the 16 people profiled are 7 entrepreneurs, a medical researcher, a United Methodist pastor, a young man who became a quadriplegic at age 17, a former Catholic nun who fought church hierarchy to establish a shelter for homeless women and children, and a Yale Medical School student who lost her femur to cancer at age 12. Also profiled are Scherrie Payne of The Supremes, June Monteiro of The Toys, and Mary Wilson of The Supremes–who provides a special message of healing and hope that forms the Epilogue of the book. We hope you enjoy reading One Door Closes as much as we enjoyed writing it. Fulfill your dreams! Unlock your true potential! Be inspired! Congratulations to MotivAct VP Jared Chrudimsky--A 6 Time Winner! To learn more about what makes Jared the Best Massage Therapist, visit www.revitalizetherapy.com. On March 28, The MotivAct Group LLC will be recognized by the Corridor Nine Area Chamber of Commerce as a Champion of Education for our support of teacher mini-grants and student scholarships. We believe that no investment is too great to ensure the future of our children, and are proud to support these initiatives! No Dream Is Impossible! In addition to being the award-winning owner of Revitalize Massage Therapy (www.revitalizetherapy.com), MotivAct vice president Jared Chrudimsky also is a member of the ACICS (Accrediting Council of Independent Colleges & Schools) team that evaluates massage therapy programs nationwide for accreditation. To see a list of Jared’s upcoming accreditation visits, visit our Events page.